My grandfather and Sol Carpenter were half-brothers and Sol’s wife was an Indian. And my grandfather, Martin Stephenson Van Buren Douglas, was one of the greatest ballad singers of all times and he couldn’t play anything. But he sang songs during the Civil War and before. Tunes like the old Willow Garden and Barbry Allen. 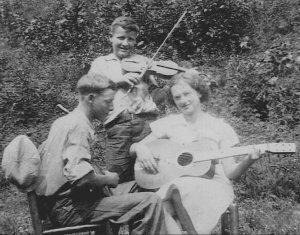 My grandmother now, she was a good fiddler and all her brothers were top fiddlers on my mother’s side, the Morris side. My mother, she used to be a pretty good ballad singer; she couldn’t play music. She’d sing The Little Blossom and those old songs. But my dad was one of the best, the plainest, oldtime banjo players you ever heard. He played it slow, but he’d put everything in it. And then he lost his thumb and he quit. But now, he had an ear for music. In the evening we’d sit out there and look to the head of Booger Hole and my father used to sit there on that front porch - and like I said, he very seldom relaxed - but when he tuned that old 5-string banjo up, he’d play that banjo - it was so doggone lonesome that it was pitiful and you could hear it all over this country. He’d play a few of them old tunes, pick the old Barbry Allen, Gunboat Going Through Georgia, Pretty Polly, and the Little Birdie.When he played four or five and he got tired, he’d quit! But that banjo would almost speak. And like I said, Grandmother Morris was an old time square dance fiddler. And 1935-36 was a severe cold winter. I was thirteen years old. I had played the guitar up until that time for various fiddlers. During that winter I lived about a mile from my grandmother’s. Every night I would take my guitar over there and play; I had learned how to tune it with her fiddle. At that time she had the only old fiddle in the country to my knowledge. The old instrument was patched with solder, carpet tacks, and various other things. She and her son lived alone. Each cold winter night I’d get in wood and coal for the old pot-bellied Burnside stove. I would stay all night and go to school from there in the morning. She would play hoedown fiddle tunes half of the night. She played mostly dance tunes on two or three strings. She seldom played the bass. That winter passed and we continued to play. The following winter her health failed her and she began to lose interest in the violin. However, that fiddle began to sound good to me. Then I suddenly decided I would quit playing the guitar and try to make some kind of a fiddler out of myself. Times was hard, money was scarce. The only work I could get at that time was on a farm. I got five cents an hour or fifty cents a day. So I started saving my money to buy me a fiddle. And I lost a lot of sweat getting it. I saved, I believe it was $10.40 with postage, in order to buy a violin. So I saved $10.50 and ordered a $9.95 fiddle from Sears Roebuck. And then I had to work me out a bow; you could buy a top bow then for $2.65. Then I got the bow and I didn’t have any case. So I carried the violin in a twenty-four pound Sunny Field flour bag! Until I got me a case. And this violin case that I bought later was $2.35 plus postage, and I kept it up to about a year ago, then I gave it away. Fiddle strings were twenty-five cents and at that time there was one penny tax plus. I’d buy them over at Clay, at King’s Jewelry Shop; his son’s still got the shop. You got Black Diamond strings for twenty-six cents and now they’re three dollars. And I couldn’t tune the violin at that time. Now there was an old gentleman by the name of Charlie Drake lived about two miles from where I lived - now this was before I got with my grandmother to learn. He could tune the violin, but he couldn’t play it, really; just a little tune or two. I’d take this old fiddle up there and get it tuned. Maybe the wind would be blowing. Put her down in that flour bag and start home. By the time I got home, the variation in the temperature would throw the E or A string, mostly, a little out. But I didn’t know the difference! I’d saw on her until she didn’t sound good, then take her back. And I did that until my grandmother taught me, until I got the sound. And, like I said, she was a good fiddler and I was a guitar player at that time. I started on the guitar when I was nine years old; I played the Carter fashion. But that fiddle got through to me. I liked it! And after she quit playing, she taught me the notes to start the Soldier’s Joy. Well, I wore the Soldier’s Joy out! And then she said, “Well,Wilson, as time goes on, I can’t tell you every little thing. If you want to play bad enough, you’ll learn.” So I kept improving. And she was ninety-one years old when she died; her health got to ailing and she just completely quit playing. Well, I finally learned to play Soldier’s Joy. After this, everyone I knew that could play a fiddle, I managed to visit them and listened to get a new tune in my mind. I tried to make it a habit to play four or five hours each day in a room to myself. And during that time there were only two battery radios in the country to my knowledge, and my father owned one of them. So every Saturday night we would listen to the WSM Grand Old Opry until it went off the air at 1:00. All the neighbors would gather in to listen to the mountain music. 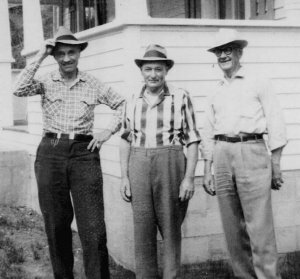 Then during that time, about 1939 or 1940, Ed Haley came in the country and that put me on, see! I was seventeen the first time I saw Ed Haley. 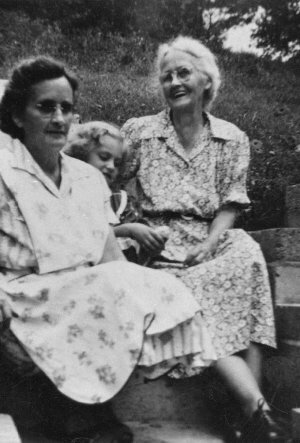 There was an old gentlemen who lived in Calhoun County joining Clay County by the name of Lorie Hicks. 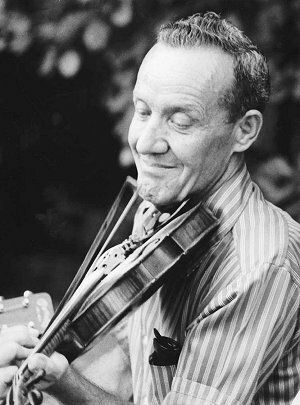 He was a good oldtime, rough fiddler. I would ride a bicycle over to his home to hear him play the fiddle. Then somehow Lorie Hicks contacted Ed Haley in Ashland, Kentucky. In about a month Haley came to Calhoun County. So the news got around through the country that Ed Haley was at Lorie Hicks’. Everybody around went to hear him play. I told my mother, “I heard old man Mr Ed Haley play the fiddle and” - I said - “I’m going to learn.” She said, “Wilson, it’s hard - I doubt it. Maybe Mother could teach you.” “Well,” I said, “I’m going to learn or there ain’t a bull in Texas!” So I started making every arrangement. Now, I wouldn’t spend a penny for nothing till I got that $10.40 to order that violin. I thought it was something, but it wasn’t really. One day it came from Sears Roebuck. I’d walk to the mailbox and I’d hear the mailboy coming and I was there to meet him - it used to be carried by buggy and team. I counted the days until that violin came, I think it was nine or ten days. It was in the carton and the mailboy said, “Here,Wilson, is your package.” Oh, man! I commenced tearing that thing open. All shiny and nice, you know! But it wasn’t, really. There’s so many things come into my mind. It was twelve miles from where I was raised over to Lorie Hicks’ where Ed Haley’d come to. He’d play until about twelve o’clock at night, and he got tired, he’d quit. I was really not conscious of coming back home. I’d ride a bike, had an old trap of a bicycle; and if a gang didn’t gather up to go in an old ’29 Model A Ford truck, we’d start walking, maybe somebody’d come along in an old car and pick us up. Or we’d start in time to walk it – Lord! It was twelve miles! And I’d come back home and I wasn’t really conscious of when I left and when I got there. I was just dazed with that fiddle. And it was just like a dang carnival, you know. We just sat and never opened our mouth and, like I said, he’d scare them fellers, them fellers never tried to play. Doc White asked him one night, said, “Ed, how do you play them tunes without changing keys?” “Well,” he said, “Doc. I change them with my fingers!” He wasn’t being sarcastic with Doc, he liked Doc. Well, when he’d take a notion to go back to Kentucky, we’d beg him to stay another week. Doc White would say, “Now Ed, listen. They’s a gang of people coming from Roane County, you can make some money. Now, you stay another week.” Ed was bad to swear. Well, they’d talk him into it. Maybe he’d make four or five dollars a night. The last night, the last time I seen him - I was a big boy and I’d got over there, had went with some fellers. I was sitting in this old split bottom chair, sleepy you know, but every time he’d play a tune, I’d revive. And he said, “Son, what’s your name?” I didn’t know that he knew that I’d been sitting in front of him - I told him - He said, “You’ve been over here every night, haven’t you?” I said “Yeah” and I said, “Mr Haley, you’ve played tunes for everybody,” and I said, “and I don’t have no money. I’m saving up money to buy me a fiddle.” He laughed! I said, “How about you playing me a tune?” “All right, what is it?” I said, “Play the Black-eyed Susie." Well, that’s really no tune. It’s just a little old thing. “Well,” he said, “dammit, I’ll play it. I don’t like to play it. But I’ll play it.” Said, “Them’s single-line tunes. But I’ll play it for you” - and he did; because I was interested, you see. And some of these old music fans, some of them - maybe you’ve noticed it - it touches them. Some of them will cry and everything else. Maybe somebody of these old farmers would come along; they’d had a tune and maybe their father played or some of their ancestors, and they’d heard it. They’d say, “Well, Ed, play me this tune,” and they’d hand him a dollar. Well, he’d play it for fifteen minutes! They’d sit there with big tears, you know. And somebody else, “Well, Ed, play this tune.” And they’d hand him another dollar. Well, he’d play till the money ran out and he’d quit! And Carpenter, he was in and out of this country a lot; he worked up around Oak Hill. Sometimes he’d come to Clay County for a weekend. I would go and stay the weekend with him; and he started to teach me to play the fiddle. French Carpenter was an interesting man. Had been a bugler in the World War. He was not a large man at all. And I guess he could have put on a flour bag and it’d look good on him. Had been a handsome man. Fair complected, hair combed straight back. And big blue eyes. Fair every way. And he was a man you couldn’t hear him walk on nothing. And this don’t make no sense: he was a feller could walk in the mud, but yet he wouldn’t get his shoes dirty! and walk across the floor, it was like cats! And dance. Lord have mercy! that man could dance! And right after the war and when I got discharged, why, after I found out Ed Haley was dead, well Carpenter came back in the country and in 1958 he retired - lived in a little old house over here right where Rush Fork and Otter meet, house is still there. And he’d take that fiddle out about dark, you know, and all them frogs hollering - you know in the spring of the year. - I thought that was the lonesomest dang thing I ever heard. So I practically stayed with him. Oh, I was with him off and on for eight or nine years. And we’d get together from one to three times a week to play the fiddle. And he had a first cousin was a hot banjo player. And we’d play all night! Play the god-blessed night! And he’d make me tune my fiddle with him. And he’d say, “Now,Wilson, don’t you try to copy me, for you can’t. That’s ruined a many good fiddler. We have a different time. If you happen to be something like me, fine. Play yourself. So we got to be so doggone good it just sounded like one fiddle, you know. I’d miss a note, he’d stop, he’d say, “Now, play that over again, you missed it, Wilson.” He’d make me get it - wouldn’t let me see no peace till I did - he was that way. And Carpenter and me’d play, and Carpenter had his time, you couldn’t push him, he had a certain time. And if he got with a musician didn’t suit him, he’d say, “Well; I don’t feel good, I’m going to quit for tonight.” You know? He wouldn't offend nobody, he was very kind. Oh, I worked every day. And I’d go up there, I was all out of steam! I’d work six days a week and I was always up to one or two o’clock in the morning with that fiddle. Well, I’d come home and I’d go to bed and that fiddle tune would keep pushing me; I couldn’t sleep, I could just almost put my finger on it. And I’ve got up at four o’clock in the morning and played that tune. And after I got it, I’d go to bed. Carpenter drove me all the time and he kept telling me he had a bad heart condition and he said, “I want to push you all I can.” And the man died in 1964 and had a couple of tunes I never got to learn. He was a wonderful old time musician. Now, I don’t claim to be a top fiddler, but I fiddle it from the heart, the way I want to and, you know, the way it does me good. There’s a lot of things I could have been. But I’m not and I’m not going to worry about them. I could’ve been many things, probably. But them hoedowns always kept me from being those things. And I’m not going to worry about them. And now I go to these conventions, and when you walk in a place - competition makes any individual good at anything you do; if you’ve got competition you want to get good right then! And if you ain’t good, it’ll put your best in you. And then - you know what I’m talking about - when you feel that chill, boy! Look out! When I feel that chill, I’m ready! I can play the fiddle then. I’m just like two preachers wanting to preach! - And sleep, hunger, fatigue leaves you. It don’t bother you till you quit and then you’re dead. By gosh, you’re dead. I’ve gone to these places and I couldn’t see no way of ever getting home without stopping along the road - and Lord! I was give out, I was sleepy - and them tunes that them old gentlemen would play would ring in my ears for a week. And when I’d come home, I don’t know, it seems like I just, like I just dropped in a hole. There wasn’t nothing there - it’s hard for me to explain. And the way I feel about music, I think these musicians - I do it myself - each one is expressing his past, his present, what he should have been, and what he hopes to be. And he’s expressing all of his sorrows, all of his happiness. - if you study him close you can almost read his life. And I think when they’re all playing good, clean, honest music - banjo-picking, guitar-playing, fiddling, what have you - I think you’re just as close to heaven on this earth as you’ll ever be. If you’ve got the music in you. You know what I mean? I believe that. I don’t mean I put that above a hereafter or above an eternal life. But in this world, that’s my Paradise. In this world.